Solar investments eclipsed all other forms of electricity generation in 2017 as China’s green boom accelerated. Investors worldwide plowed a record $161 billion into solar energy last year, more than half the investment in all renewables apart from large hydroelectric projects, according to a report jointly published by the United Nations and Bloomberg New Energy Finance. Total investment in renewables rose 2 percent to $280 billion. In its bid to no longer be seen as the world’s worst polluter, China invested $127 billion in renewable energy last year. More than two-thirds of that was for 53 GW of solar energy, enough capacity to power more than 38 million homes. Renewables made up a record 61 percent of net power generation capacity added worldwide in 2017. Actual output from clean energy sources accounted for just 12 percent of electricity production, illustrating the gap that needs to be bridged before clean energy can overtake fossil fuels. Are we making progress in renewable energy? 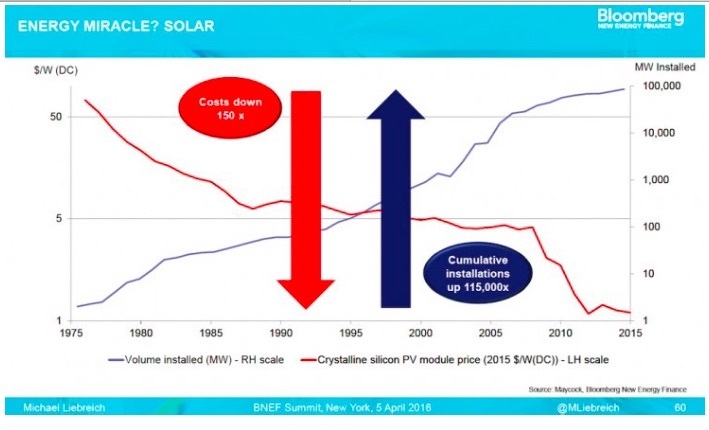 The costs of solar and wind energy have shrunk dramatically in recent years, making the economic case to transition away from carbon-intensive energy sources all the more compelling. Even though coal and gas are still the cheapest sources of electricity, that’s likely to change as soon as 2023, according to BNEF. China, Australia and Sweden saw the largest increase in investment, which declined for markets that have historically led the way for renewables. U.K. investment fell by 65 percent while Germany’s slipped by more than a third. Global emissions rose to a record last year in the first annual increase since 2014. (Thank you to the Good News Agency for calling our attention to this article.